This program is primarily designed to provide notified body auditors and regulators an in-depth review of clinical evaluation and investigation requirements in the EU and what to look for when inspecting the clinical section of a medical device manufacturer’s technical file. 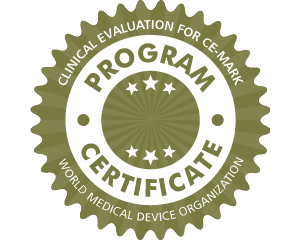 The courses in this program provide a step-by-step review of existing clinical evaluation data, emphasizing how to correctly consider comparator devices and their data sets. They introduce a clear regulatory link between clinical evaluation reports of existing data and considerations for the need of prospective trials. This program offers valuable tools for the essential review points of clinical investigation master files and safety reporting requirements. It has been peer-reviewed by the UK MHRA. Learners can further their knowledge of this program by completing the “ISO 14155: 2011 GCP ” certificate program.